At wizard step 2 (Create Implementation Plan) create or update an engineering change task (ECT). 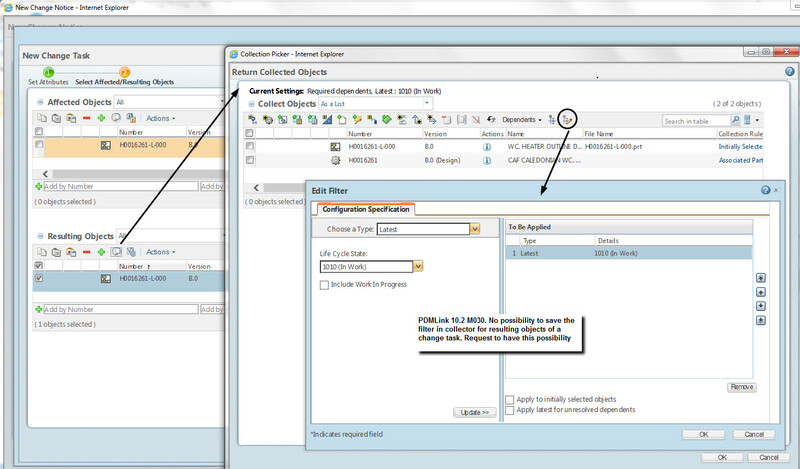 At wizard step 2 (Select Affected/Resulting Objects) copy the affected object to the resulting objects table. In the resulting objects table select the object and in the action menue click on the icon "Collect resulting objects". In the collector "Return Collected Objects" click on the icon "Edit filter". The Edit Filter dialogue appears where one can change or create a filter for the current session. There is no possibility though to save this filter. The request now is to have the possibility to save the filter for new ECN/ECT's. See also screenshot below. similar to Collector Windows should have a "Saved Filters" function.